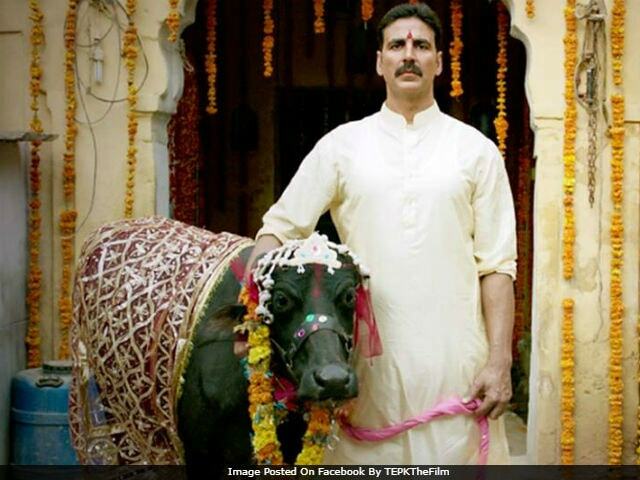 Toilet: Ek Prem Katha Movie Review: Akshay Kumar is sincere, but this film is too painfully long and preachy to be effective. Ablutions need to be efficient. Toilet: Ek Prem Katha - an oddly titled film that aims to yank us out of our en-suite bathroom lives and into the open fields where a shamefully large percentage of Indians still do their business - takes a constipatedly long time to make its point, and gruntingly labours at it, ticking boxes from a government-approved checklist. The result is a public service commercial weighing in at nearly three hours, the kind of thing even Doordarshan would have chosen to telecast right after Krishi Darshan, not at primetime. Akshay Kumar, bless his soul, gamely gives it a go. Playing a 36-year-old bicycle-seller (and nearly looking the part), the miraculously fit leading man sprinkles even this clunkily directed and soap-operatic film with moments of nuance, best glimpsed in casual, wordless shots like when he casually slaps a man on the street for staring at a woman, or when he dances with goofy abandon at his own wedding. Were this film a half hour shorter and significantly less preachy, he'd have carried it off. As it stands, he's a casualty. Director Shree Narayan Singh sets up his picture peculiarly, never quite mastering his tone or balancing his motives. The first shot we see of Akshay Kumar is accompanied by a down-blouse look at a choli-clad village belle, an odd choice for a film that is a righteous lecture. Kumar, as mentioned, slaps someone for staring at a girl while himself stalking one and slyly photographing her with his phone. For a film against open defecation, hygiene never comes into play as a subject. There is no consistency. At one point the film is an instructional video in how to apply for Public Interest Litigations, and the very next minute it devolves into a flimsy melodrama about divorce. Divorce comes into play because the girl Kumar photographs, and eventually wins over with his knowledge of trivia - his looks might have played a part too, I suspect - is a plucky college-topper called Jaya. Played by Bhumi Pednekar, this girl might not be able to pronounce 'Toilet' correctly but demands one, and this isn't a simple ask. Kumar's Keshav is the son of a fastidious pandit who'd starve before he lets a bathroom be built in the same yard where his tulsi plant grows, and Jaya must thus look outwards for relief. Kumar and Pednekar have a few pleasant moments - he's great when trying to seduce her to bed casually, his daantun in hand; she's gleeful at finding a commode in a neighbour's house - and the two engineer a smart, albeit unsustainable, workaround: he ferries his bride regularly to the train station and, during the minutes the train is stationary, she uses the facilities. This entire sequence is refreshingly romantic, though the modern girl tires of it soon enough. It is a tiresome predicament in a tiresome film. There is nothing inherently wrong with a film that knows which way taxpaying bread is buttered and decides to cheerlead the government in power, but there needs to be some balance. Things get downright harebrained when the the lack of toilets is blamed on governments gone by while the current one is feted blatantly. "When our Prime Minister can stop currency notes," questions a minister at one point, "Why can't we stop our bowels?" When Keshav is asked a prickly question by a television journalist, his first reaction is to ask whether she works for a foreign channel. Had there existed a (censor-approved) translation for 'fake news' in Hindi, he'd have used it. The film goes a long way in bringing a subject to the mainstream, and it means well. This intent and Kumar's charm - along with Pednekar's sincere but obvious performance, flitting from irritated face to happy face - keeps things afloat at first, but all hell breaks loose (and hell, loos are broken) as the screenplay is gradually replaced by a government pamphlet. It all becomes painfully predictable, from a media scrum to a nick of time climax, and this film could well have been titled Poop-li Live. Somewhere in the middle, there's a completely unwarranted subplot about a fake thumb. Even that thumb, like mine, would be pointing downward at the end of this film. It may want to change the country, but - as either a romance or a public service announcement - this Toilet doesn't wash.